For details on how to install, how to measure, and how to change the combination of these keyless entry locks, click on one of the links below. What is the difference between a deadbolt lock and a latchbolt lock? How do I measure the back set? 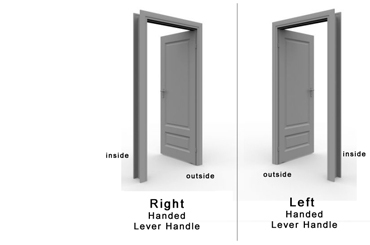 How do I tell if I need a right-handed or left-handed lever handle? How do I install these locks? What is the difference between a spring latchbolt and a magnetic latchbolt? Can I order an oversized knob? What is a push/pull handle? What type of key cylinders are used? I need a lock that will hold up near the ocean. Do you carry any that are marine-grade? Do you have any keyless locks in which multiple combinations can be used at the same time? Is there any discount for buying multiple locks? What is the Initial Secret Code? How do I change the secret code? Does it matter in what order I enter the combination? Why would I order extra tumblers? Tips on selecting a secure secret code. Can these locks have more than one combination at a time? Do you have a lock that will lock every time the door is closed? Can these locks be locked as well as unlocked from the outside? Do you have a lock that can be installed on an interior pocket door? What can my combination be? And how many combinations are there? With the key override option, is this lock pickable or bumpable? Would I need a professional to install any of these locks? The instructions call for a 22mm hole, but I can't find a 22mm drill bit in a store. Is this a complete door set with all the components I will need? I have installed my lock, but it doesn ' t seem to be locking correctly. What's wrong and how can I fix? If you don't see your question above, don't worry. Just click here to send us an email . We'll get back to you as soon as possible, usually within 1 business day. What is the difference between deadbolt locks and latchbolt locks? Deadbolts must be locked manually. Our keypad deadbolt locks work just like the common keyed deadbolts locks you are used to — the lock's bolt stays unlatched and unlocked (retracted) until you turn and lock it. You can do this on either the inside or the outside. Latchbolts lock automatically. Our keypad latchbolt locks work differently — they latch and lock automatically every time you close your door, just like an interior door in a house. Their latchbolts are normally extended, so when you close your door, the latchbolt hits the strike in the frame around your door and is pushed into the lock until your door is closed and the latchbolt lines up with the hole in the strike plate. 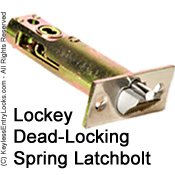 At that point, the spring inside the lock pushed the latchbolt out again so that it latches and locks automatically. Some of our latchbolt locks ALWAYS lock when closed and others have either a passage feature (also called hold back feature or classroom mode) that prevents them from locking. If you plan to go in and out frequently (to unload groceries, say), this can be quite handy! How do I measure the backset? The backset is the distance from the edge of the door where the lock engages with the door frame to the point in the lock mechanism where the spindle, sometimes referred to as a tailpiece, goes through the lock. (The spindle is the piece of metal that connects the knobs, levers or thumb turns on either side of the lock so that when they are turned the lock opens or closes.) To measure the back set, you only need to make 1 simple measurement. See the diagram below. How do I tell if I need a right or left handed lever handle? When standing outside of your door, if the hinges are on the LEFT side, you have a LEFT HANDED lock and you will need the LEFT HAND option for lever handles and 1100 Series locks. The opposite is true for a RIGHT hand lock. When standing outside of your door, if the hinges are on the RIGHT side, you have a RIGHT HANDED lock and will need the RIGHT HAND option for lever handles and 1000Series locks. For interior doors, the outside is the side where you enter the combination. How do I install these locks? It is very easy. You can probably do this yourself. Click here to view. This is a dead-locking spring latch bolt. This means it has a dead latch mechanism, called a plunger, which slides in and out along its top side. When the door is closed, the strike plate presses in the plunger and prevents the latchbolt from opening independently of the handle. When properly installed, dead-locking latchbolts cannot be opened by sliding a credit card between the door and the door frame. Spring latchbolts are normally extended when the door is ajar. 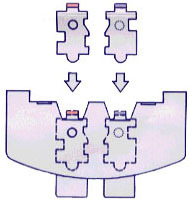 As the door is closed, they come into contact with the strike plate. This pushes the spring latchbolt into a retracted position until the door lines up with the hole in the strike plate. Spring latchbolts can take quite a beating on heavy gates or doors that are slammed shut. A magnetic latchbolt has a small but quite strong magnet in the extended end of the latchbolt and another one in the special strike plate that comes with it. This type of latchbolt is normally retracted inside the lock until the door is closed and the latchbolt is lined up with the strike plate in the door frame. When everything lines up, the attraction between the two magnets pulls the latch bolt out of the door and into the strike plate box which latches and locks the door. This type of latchbolt will hold up much better than a spring latchbolt on heavy doors and gates and in high traffic areas because it is retracted and is not hit each time the door is closed. The magnetic bolt is also a bit stronger than a spring latchbolt because it is a little longer and does not have a diagonally cut face. Instead, it is shaped more like a deadbolt. 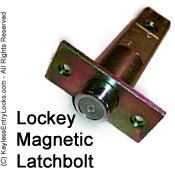 Magnetic latchbolts are only available on the Lockey 1150 and 1600 Heavy-Duty Locks. How do I change the code? The code can be easily changed in just a few minutes. All you need is a phillips head screwdriver and a regular pair of tweezers which are provided with your order. Hold the outside body in the horizontal position. Remove the 4 red screws. 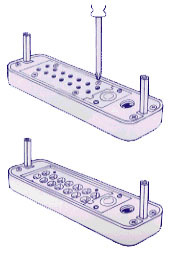 Carefully remove the plate, as there are many springs attached to it. You must press in the C button from underneath until you have completed the code change, as it is impossible to lift out or insert the code tumblers if you don't. Forcing them will damage the lock. There are blue tumblers (non-code) and red tumblers (code). Your code is made up from the red tumblers always prefixed by C to clear. Never remove the C tumbler. While continuing to press in the C button, using the tweezers provided, lift out the code / non code tumblers you wish to change. When you re-insert the code/non code tumblers for your new code you must continue to press in the C button. the tumbler is facing upwards. Match the shape of the tumbler to the exact cut insert of the body. The code is made up of the numbers which have the red tumblers inserted next to, this shows C2469X. Remember the red tumblers are the code and the blue tumblers are non-code. 3 digit number up to a 7 digit number, always prefixed by C to clear. To increase, remove the blue and add the red. To decrease, remove the red and add the blue. If you insert a tumbler in the wrong position, press in the C button and lift the tumbler out. 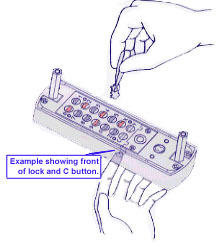 When you have completed changing your code, release the C button and replace the plate carefully. Always test your new code before installing/re-installing your lock to the door. The finish on the exterior and interior sections of the lock are the same for all models except for the Lockey M213 Lock (which only comes in Satin Chrome on the inside). Finishes are subject to availability.